Georgia apparently landed John Cannon (6'10" Center from NC) for the 2011 recruiting class. 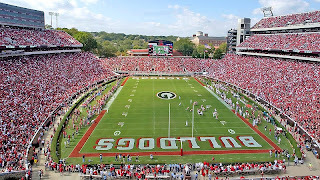 Georgia beat out Northwestern, High Point, UNC-Wilmington, Western Carolina, Richmond, ODU, Presbyterian and an offer to be a walk-on from UNC. That's an offer list more analogous with Dave Bliss, Troy Brewer and Steve Newman than Kentavious Caldwell. The late offers from Richmond and ODU are a little encouraging, but jeez. I don't get it. Why with all the talent in the world for 2011 and 2012 in this state is our coaching staff up in North Carolina spending time chasing a kid that hasn't drawn any meaningful major college interest. Bizarre. As a point of perspective, I think it's helpful to remember that the 1983 Final Four team had four McDonald's All-American recruits on it. 'Nique would've made five had he stuck around for his senior year. If we ever want to return to the biggest dance, we're going to have to get into those kinds of living rooms and close the sale. Former UT signee Kevin Ware looks to have untangled himself from a sticky situation with a "runner." The NY Times details his situation. The raw manipulation the UCF coaching staff is implicated in here is pretty seedy. The idea of allowing yourself as a coach to "secretly listen in" on a call between a recruit and a runner is pretty out there in terms of manipulation. Here's hoping Ware or Ryan Harrow (NC State transfer and former 5 star PG) find happiness in Athens along with Shaq Goodwin, Jordan Adams and others. If you're wondering about scholarship numbers...last year we had 12 kids on scholarship including Nolte and Bucklin. We lost 4. That means we had 5 to give. There's no question that Bucklin's ship would be available if we needed it. So we have at least 1 more if we need it. and if push came to shove, there's always 1 more out there if you need it. I thought Fox was supposed to be this great recruiter & developer of talent? I don't understand how he can dramatically improve UGA's program and still not get good talent from the state of Georgia?? Fox has signed Dixon (6'10"), Florveus (7') and the kid from Montenegro (6'8"). All in this class. All posts. In addition, he signed Donte (6'9") and Thornton (6'8"). He says all are going to qualify and Thornton and Donte are having a great Spring. And he knows we're SWIMMING in talent in the 2012 class in state. So...why are we locking up a scholarship for a mid-major at best talent. That's 6 ships for post players among whom all (except the international kid who I know nothing about) are miles away from being front line SEC players. You can't tie 6 of 13 scholarships on role players. He has to KILL IT in recruiting the next 100 days. PS -- I really like the guy and want him to do well. But he has to step it up. We have ZERO reliable options in the post. I hope Thorton continues to become more comfortable and contribute, but he's 6'8" and thin. We're losing Thompkins, Price, and Barnes -- that's a lot of bulk. We need all the bodies we can get down low, IMO. This is what happens when you whiff on guys like Royal and Jacobs. You have to find a kid in North Carolina with no offers from the instates schools. Unfortunately, this seems to be a pattern as we are chasing the Alabama PG with no offers from the instate schools since we missed out on DaiJon Parker and Bolden. Thin and raw but talented. Thanks for stopping by the blog yesterday. This Ware situation has certainly been odd to say the least. Now add unfortunate to that sentiment. As far as the Cannon situation, I think (though I'm not 100% certain) that we have one very iffy grade situation. I'm sure you've heard the rumors, though I think the commitment of Cannon should shift light to another position. I really think Fox is planning on playing matchups here. You can't atttract the top guys if you aren't winning and you can't win with an empty bench and a bunch of scholarships to hand out for a loaded 2012 class. I'm pretty confident that CMF will find a way to get scholarships to whatever 5-star that may want to commit next year. From all I've seen and heard, he'll find a way to make room. While I would love to add Harrow, I have been wowed by 2012 5-star PG DeOndre Haynes out of AL, who we are purported to lead for. Who knows. I love Fox and want him to be great, but in my opinion, the jury is still out on him. We had a hell of a lot of talent on the team last year and we were "OK" by all other team's standards. This is actually more of a sonnet than a comment. Apologies. I just hope Fox isn't banking on Shaq and Adams at this point. Shaq's new AAU team is solely Memphis area players and him. That doesn't make me feel good and it makes me feel even worse to hear that Adams pushing back his decision date last month was "good" for us. I wish we knew what was going on with Jeremy's brother and cousin as well. It seems like we could have landed one of them by now just to have something to point to. If we have given away ships to the JUCO, the Serbian, and the NC kid to the point we can't take Reid and Price, that seems like a terrible decision. No need to mortgage our future for next year when we are going to be bad anyway. Welcome to UGA, kid. The very day you announce you are coming a blogger wants to trash you. Jeez, PWD. We offered the kid. Can't blame him for wanting to come here. Let the kid enjoy his big day without being trashed. There will be plenty of opportunity to trash him later. any football post coming soon? If we can get Harrow, it's the 3rd best class in the SEC, including transfers, after UK and Arky. Some of that is quantity over quality, but you need role players like Dixon and Cannon to mesh well. UConn had one horse they rode most of the season (Walker) and a bunch of role players until Lamb jumped on the scene. Some of their best players were freshmen too! I would say they were the definition of thin, raw, and talented and they went all the way. Trust in CMF! According to Rivals, we have a top 25 class. Guess it's not as bad as you are acting.